EDITOR'S NOTE: The Swnews4u.com Athlete of the Week is a web-only feature that will publish each Thursday throughout the calendar year. MADISON — It’s been a long, winding road to the top for Iowa–Grant/Highland senior Drew Hennessey. The talented multi-sport star at Highland High School made surprise run to the state finals three years ago as a freshman and his future seemed limitless. Then, Hennessey suffered a gruesome knee injury at the conference meet a year ago that derailed his junior season, but he finally reached the pinnacle of prep wrestling Saturday night at the Kohl Center in Madison. 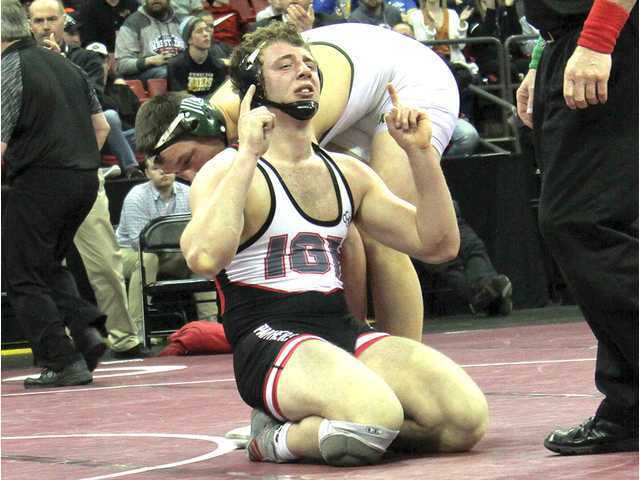 Hennessey, known for his lightning-quick first period pins, was pushed to the limit, but ultimately prevailed over Edger junior Ethan Heil 6–5 in the 220-pound Division 3 state championship match to claim Iowa–Grant’s 16th individual state wrestling title. In the finals, Hennessey jumped out to a 6–1 lead over Heil, getting three early takedowns. But after a reversal in the second period the lead was cut it half at 6–3. Hennessey began his state title run Friday morning with a second-period pin of Athens junior Conner Westfall (33–8). He then pinned Coleman sophomore Spencer Karban (28–16) just 28 seconds into their semifinal bout Friday night. Hennessey finished his senior season 40–1 overall after going 37–5 as a junior. His only loss this year was a quarterfinal loss to Danny Striggow (44–2) of Orono, Minn. at the Bi-State Classic in La Crosse in late December. Hennessey finished his career with an overall record of 145–28. He was a two-time conference champion and a three-time state qualifier. Hennessey finished second at 170 pounds as a freshman and fifth at 182 as a sophomore before capturing a state title Saturday night. Birchman (33–12) finished second in Division 3 at 126 pounds to lead lead a school record contingent of 10 Fennimore wrestlers at last week’s WIAA State Tournament. Birchman advanced to the finals with a dramatic semifinal pin of Phillips’ Javyn Freeman Friday night. He trailed 4–1 in the closing seconds, but was able to get a reversal and a pin with just five seconds left in the match to advance to Saturday night’s finals. In the finals, Birchman gave Coleman senior Caleb Gross, ranked #1, all he could handle, but Gross (43–3) prevailed in a 3–0 decision. Belmont/Platteville/Lancaster gymnasts — Lizzy Haag, Jr.; Brooklyn VanNatta, So. and Hailey Jentz, Fr. Haag, a junior from Belmont, VanNatta a sophomore from Lancaster and Jentz, a freshman from Platteville, each earned top-5 finishes at Saturday’s WIAA Division 2 Platteville Sectional to earn individual berths to this Saturday’s D2 Team State Championships and helped the Hillmen to a second-place finish that earned the team a berth in Friday’s D2 Team State Championships. VanNatta placed fifth on the vault (8.425), as well as sixth in the all-around (32.45) and the floor exercise (8.525). Haag finished fifth on the uneven bars (8.05) to earn her second trip to the individual state championships. She also quailed on the bars two years ago as a freshman. Jentz (8.525) edged teammate Lindsay Wolf (8.475) for the fifth and final state berth on the balance beam. Bontreger (47–2) at 106 pounds, Klein (39–8) at 182 and Straka (41–7) at 195 each wrestled to second-place finished in Division 3 at the WIAA Individual State Wrestling Tournament at the Kohl Center over the weekend. Bongtreger lost a 6–3 decision to Cameron’s Tanner Gerber in the finals. Klein, who finished his career with a record of 124–51, was pinned by Boyceville’s Trett Joles in the finals. Straka dropped a 3­–2 decision to Bonduel’s Jacob Giese in the 195-pound championship. Misky scored a game-high 22 points on the night to top the 1,0000-point plateau for her career in a 61–52 WIAA Division 4 regional semifinal loss to Lancaster last Friday night. Misky’s 3-pointer with 14:30 remaining to gave the Cubans their largest lead of the night at 35-28, but the Flying scored 19 straight points to rally for the victory. Rohrbach scored 13 points and had eight assists and five assists to led Platteville to a 63–39 victory over Lancaster last Thursday night. The win helped the Hillmen (15–5, 9–1) clinch a share of a second-straight Southwest Wisconsin Conference title. Platteville will host Marshall in a WIAA Division 3 regional semifinal Friday night at PHS.